Located at 7 Spring Street, Westport, ON K0G 1X0. 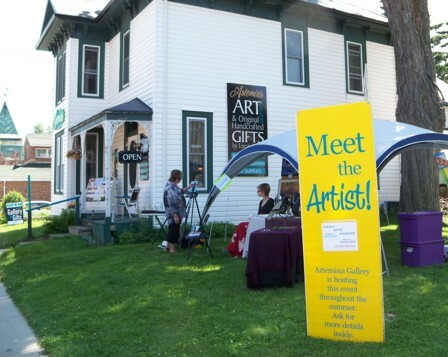 Artemisia is a great shop and a wonderful place to take art classes and offers visitors and residents many things to do. You can also often meet the artists whose work is on display. Located on Mountain Rd. just outside of Westport. The beach is something fun to do for the whole family. There is a nice gazebo to sit at as well as occasional activities at the beach house. The Lions Club Beach is home to the yearly Canada Day Celebration. The beach is located at the edge of Sand Lake. A rather calm lake with cottages and homes on the left side and beautiful foliage on the right. Located at 37 Spring Street, Westport, ON K0G 1X0 (Westport Community Centre). Every summer during the month of July & August on Wednesday evenings, doors open at 6pm and bingo starts at 7:30pm. Up to $2000 in prizes given away every week. Bingo is a great thing to do in Westport. 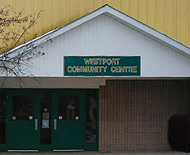 The Westport Community Centre is located at 37 Spring Street, Westport, Ontario. Seasonal rink is open from early September to late March. Equiped with canteen and heated spectator seating. Home of the Westport Rideau Jr. B Team, Westport Area Skating Club and North Leeds Minor Hockey – Stars! Public skating is available on Sundays from 1:00 – 2:20 pm and Tuesday & Friday from 9:00 – 10:30 am. Admission is $2.00. Get your skates on and enjoy family fun on the ice skating rink. Generally most Friday evenings during hockey season you can watch the Jr. B Hockey Team play at the Westport Community Centre starting at 8pm. To view their schedule click here. Located at 43 Bedford Street, Westport, ON K0G 1X0 (in front of Soho’s). With a wealth of local producers and artisans to draw from, the Westport Farmers’ Market is a great thing to do in Westport. The Farmers’ Market offers the local community and many seasonal visitors fresh local food, quality handmade products, and friendly service. 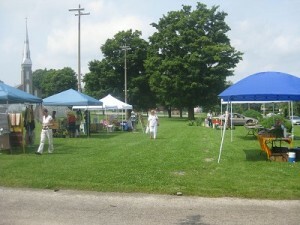 The 2011 season is offering Free Yoga classes every Saturday from 10-11am. Foley Mountain Conservation Area is located high atop a granite ridge overlooking the Upper Rideau lake and picturesque village of Westport, 50 km south of Perth. It is owned and operated by the Rideau Valley Conservation Authority. The Conservation Area consists of 325 hectares (800 acres) of mixed forests, ponds, and fields. The five hiking trails, group camp area, scenic Spy Rock lookout, and picnic areas set the stage for a quality outdoor education experience. Shillington Park is located just outside the village of Westport and offers easy walking trails through the wooded area that surrounds the softball diamond, community hall with canteen, 2 shuffle boards, 2 tennis courts, playground, gardens and sheltered picnic areas. 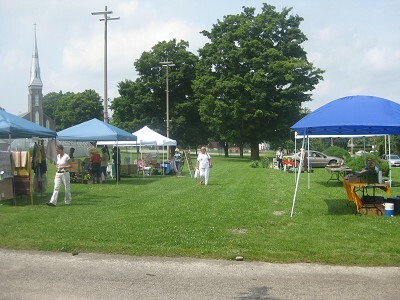 Shillington Park is located behind the North Crosby Community Centre right off of Perth Road (which leads to Kingston). 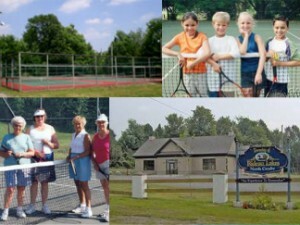 There is a park in the heart of Westport Ontario right off of Concession Street behind the Westport Community Centre. There you will find a basket ball court, baseball diamond, shuffle board, and a slide. Located on County Road 10 and the 8th Concession in Shillington Park, neighbour to the Township’s Municipal Airport, the community hall is available to various community groups, for private functions and other activities. There is a fully equipped kitchen thanks to a Trillium Grant and large meeting room. The kitchen doubles as a canteen for outdoor events. Regular events include euchre groups, Adult Friendship Club, art classes and more. 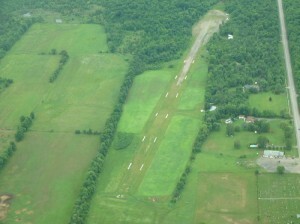 Owned by the township, the air field is managed by the Rideau Lakes Flying Club; it was registered by Transport Canada in 2001 and is listed in the Canadian Flight supplement as CRL2. The Rideau Lakes Flying Club is a group of high fliers hosting two events each year. The first is a Fly In for chili & a bun held in February. The largest event is the annual breakfast Fly In held the last Saturday in May. This event typically attracts 40 + aircraft when weather permits. The Rideau community is invited to attend and participate in these events. Without their support continued success would not be possible. For more information about the Rideau Lakes Flying Club call Bill Green @ 613-273-5282. About a year ago we asked you what your favourite things to do in Westport are. Based on your responses we created a flyer. If there is anything we missed, let’s add it to this page! You can fill out your favourite thing to do in the below form. 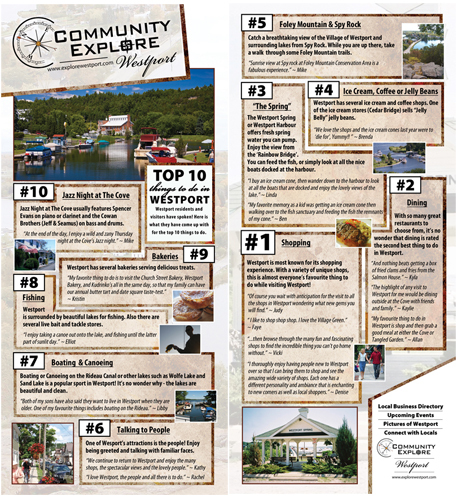 Click on the image below to download the PDF version of the 10 Things to do in Westport.